“Bitter Harvest”, opening today at the AMC 25 Theater in New York is the first narrative film treatment of one of the 20th century’s greatest human disasters, the death by famine of millions of Ukrainians due to Stalin’s forced collectivization. The Ukrainians call this the Holodomor. The subject matter alone would make this film worth seeing, no matter your take on what is arguably a highly-charged question for many on the left. Beyond that, it is a dramatically compelling film about the life of a prototypical young Ukrainian from this period, a young man named Yuri (Max Irons, the son of Jeremy) who is torn between the peasant life of his native village and the allure of cosmopolitan Kiev where several his friends have gone to become part of the socialist experiment. For Yuri, Kiev is a place where he can also develop as an artist under the tutelage of instructors imbued with the revolutionary fervor of the pre-Stalinist USSR. Filmed in the agricultural heartland of Ukraine, “Bitter Harvest” begins with a depiction of the daily lives of peasants that in the 1920s followed patterns that had existed for hundreds of years. It is circumscribed by the growing season, the harvest, religious observations and festivals. Considering the deep roots of Ukraine’s agrarian society, there would be clashes with the new communist authorities under the best of circumstances. Ivan (Terrence Stamp), the village chief and Yuri’s grandfather, is tradition-bound. He is a religiously observant Cossack who would be the proverbial square peg in the round hole of a modernizing Bolshevik society. His swordsmanship would prove to be little use against the modern Red Army of the late 20s that came to impose the forced collectivization. Natalka (Samantha Barks) is Yuri’s first and only love who remains in the village while he goes off to Kiev to pursue a career as an artist. As the Holodomor unfolds, she and Ivan become inconveniences to the Stalinist police who are determined to break the back of peasant resistance. The mainline of the plot involves Yuri risking everything to return to the village to be reunited with Natalka, from which they embark on a desperate bid to flee the Stalinist killing machine. In many ways, the most interesting characters in the film are those who are caught between Ukrainian tradition and the emancipatory vision of the October 1917 revolution. One of them is Mykola, Yuri’s friend from the village who becomes a party official and totally committed to Stalin’s rule even as he becomes purged and executed. The other is art instructor Temchuck who insists on Yuri breaking from the folkloric style he developed in the village and embracing a much more radical aesthetic in keeping with the infant Soviet Union. As Stalin imposes socialist realism, people like Temchuck risk their lives by opposing the new diktats. The heart of the film, however, is about the drama of millions of Ukrainians who were forced into state farms and collectives in the late 20s as Stalin declared a war on the kulaks—the wealthier peasants who resisted the seizure of their crops for a hungry urban population. When Stalin (Gary Oliver) is advised by his toadies that the seizures will leave the peasants vulnerable to famine, he fulminates against them and escalates the war on the kulaks as well as poorer peasants. I will be posting the only “Fresh” review of this film on Rotten Tomatoes, where it has been dismissed as a TV movie (director George Mendeluk, a Ukrainian who grew up in Canada, has made TV films for many years) filled with mawkish melodrama. 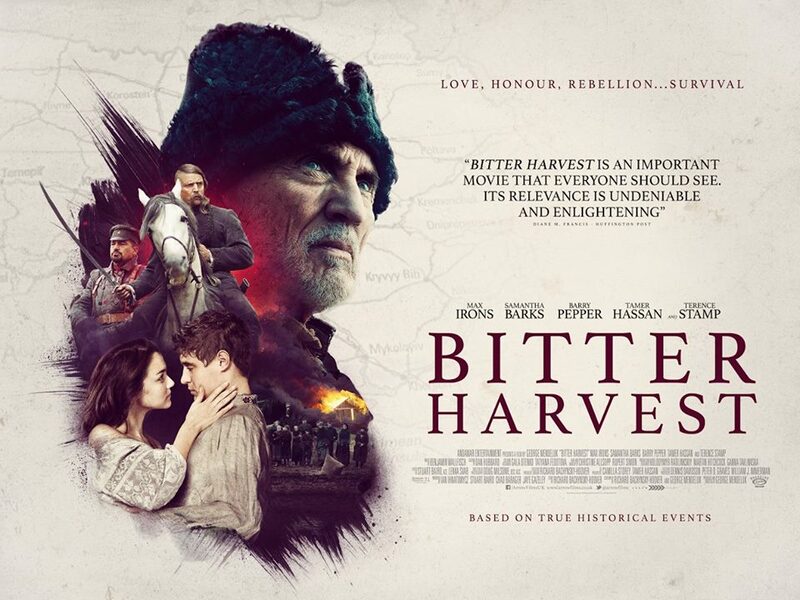 No matter how accurate the criticisms are, people trying to understand the Ukrainian political crisis of today will have a much better understanding after seeing “Bitter Harvest”. Needless to say, the Ukrainian press differs sharply from Mendeluk’s detractors at the Village Voice and elsewhere. As it happens, the first time I came across a reference to the Holodomor was in a January 12, 1988 Village Voice article titled “In Search of a Soviet Holocaust: a 55-Year-Old Famine Feeds the Right” by Jeff Coplon (a copy of the article can be found on Grover Furr’s website). Coplon’s main target was a documentary titled “Harvest of Despair” that can be seen on Youtube. Like many of Assad’s supporters on the left, Coplon’s focus was on demonstrating that photos and archival footage shown in the film were fake. You can see the same thing today with efforts to prove that videos of White Helmets rescuing injured people from bombed out buildings in East Aleppo were fake. Coplon can’t sidestep the reality of Stalin’s killing machine, however. Despite his objection to the documentary’s claim that seven million died, he concurs with Soviet émigré scholar Sergei Maksudov that the famine caused 3.5 million premature deaths in the Ukraine — 700,000 from starvation, and the rest from diseases “stimulated” by malnutrition. Perhaps the documentary presented a false total, but when you consider the unnecessary death of 3.5 million people, you must wonder why it is so hard to understand the deeply nationalistic hatred of the Kremlin in Ukraine, a country that Lenin described as Russia’s Ireland. Who knows exactly how many Irish men, women and children died from the potato famine? Or Bengalis during WWII because of British misrule? Scholars do not know exactly how many Bengalis died, with the estimates ranging from 1.5 to 4 million. Can we not say that any deaths incurred because of British colonialism are too many? Should we excuse Stalin because he was supposedly building communism that entailed warfare against the stubborn and reactionary kulaks? Coplon was a Canadian trade unionist, about whom I know nothing except for his authorship of the Village Voice article. A fellow Canadian trade unionist named Douglas Tottle presented the same analysis in a book titled “Fraud, Famine, and Fascism: The Ukrainian Genocide Myth from Hitler to Harvard” that like Coplon’s article can be read online. Stalinism past and present has denied the truth of the terror famine in Ukraine. As with Coplon, Tottle cannot exactly deny that millions died in the early 1930s famine. There is just too much evidence. So instead he focuses on the instances of “fake” photographs, overstating the number of people being killed, and ultrarightists seizing upon what amounted to an unfortunate mistake to fan the flames of anti-Communism. In many ways, Tottle’s 160=page book is simply a longer version of Coplon’s article. 90 pages of Coplon’s book is devoted to exposing the rightwing campaign by people such as Robert Conquest to use the Holodomor to discredit socialism but only 12 pages are devoted to the causes of the famine itself. For Tottle, Coplon and many others bent on making Stalin’s policies seem less cruel, there is an emphasis on intentionality. They argue that Stalin did not set out to kill people because of their ethnicity in the way that Hitler exterminated Jews and Romas solely on racial grounds. His war on the kulaks was hampered by mistakes but it was not a planned genocide. In fact, except for Hitler’s death camps, every systematic mass killing can be rationalized as a necessary evil to advance a modernization project. For example, Trotskyist intellectual George Novack wrote in “America’s Revolutionary Heritage” that the bourgeois revolution had to “rid American society of its precapitalist encumbrances (Indian tribalism, feudalism, slavery)”. Wasn’t the Ukrainian peasant village a precapitalist encumbrance as well? For that matter, if Mustafa Kemal’s creation of the modern state of Turkey represented one of the last true bourgeois revolutions, wasn’t it necessary to expel the Armenians who constituted a threat to unifying the country? Like the Cherokee’s “trail of tears”, there were many unfortunate deaths but the logic of capitalist modernization is absolute. There is also the question of Tottle’s scholarship. To bolster the case that the Ukrainians were responsible to some degree for their own starvation (in the same way that many on the left charged Syrian rebels with launching a Sarin gas attack on their supporters), he cites Nation Magazine reporter Louis Fischer who visited the USSR in 1932 and filed a report that stated: “I myself saw, all over the Ukraine in October 1932, huge stacks of grain which the peasants had refused to gather in and which were rotting…Then these same peasants starved”. While never a member of the CPUSA, it was obvious that Fischer followed the party line assiduously. New York Times reporter Walter Duranty, who appears briefly as a character in “Bitter Harvest”, once said in defense of Stalin that “you can’t make an omelet without breaking a few eggs.” This is pretty much the same thing you get from Tottle who ends his brief write-up on the famine citing data that attest to the enormous “leap forward” of Stalin’s industrialization, which supposedly would have failed without the war on the peasantry. While Coplon and Tottle were simply writing propaganda, many serious scholars of the 1931-1933 Ukraine disaster agree with them that Stalin was not carrying out a genocide against a nationality. They argue that Ukrainians suffered more than any other segment of the population because it was their land, livestock and labor that was largely involved in the breakneck collectivization. Andrea Graziosi wrote an article for the Harvard Ukrainian Studies (Vol. 27, 2004-2005) titled “The Soviet 1931-1933 Famines and the Ukrainian Holodomor: Is a New Interpretation Possible, and What Would Its Consequences Be?” that tries to see the question of intention dialectically. To start with, Lenin and the “old Bolsheviks” always saw the national and agrarian questions as interrelated. To a large degree, if the Czarist empire was a “prison house of nationalities”, as Lenin put it, it was necessary to break the back of the landed gentry and carry out land reform in those regions that were largely in the “lesser nationalities” like Ukraine, Kazakhstan and Georgia—all dominated socially by the peasants. So naturally, when peasant resistance to forced collectivization began to grow in Ukraine, it would take on a nationalist character. When people like Coplon and Tottle get upset over Ukraine’s long-standing nationalist grievances, they fail to understand that it is fueled by the class oppression of the peasants that was partially addressed in 1917 but later on became a second serfdom. Even in the Ukraine itself, there were demographic differences between city and countryside. Places like Kiev were largely made up of Russians, Jews and Poles while the peasantry remained Ukrainian. On these premises, Ukrainization programs in the Russian republic were abolished. Several million Ukrainians who, following the pro-Russian border choices of the mid-1920s, were living in the RSFSR thus lost those education, press, and self-government rights that other nationalities continued to enjoy. The 1937 census would reveal that only 3 million RSFSR citizens defined themselves as Ukrainians versus the 7.8 million of 1926 (at least part of this decline was caused by the promotion of Kazakhstan, previously a RSFSR autonomous republic, into a Soviet one). In other words, Stalin was carrying out a policy like the one that Mustafa Kemal carried out against the Kurds and that the USA has carried out against American Indians. When you use the police and army to force peoples to assimilate into the language and culture of the dominant nationality, it is easier to dominate them economically. As is well known, during the 1920s in the Ukraine the CP(B)U conducted … enormous national-educational work which went down in the history of the Party and of the Ukraine under the name of ‘Ukrainization’ (or ‘de-Russification’). The Ukrainian language was introduced into all spheres of social, civic and industrial life, knowledge of Ukrainian history and culture was fostered, there developed a sense of national belonging and of the national duties of a Ukrainian communist; in literature and journalism extensive discussion of nationality problems was permitted, and particularly the satirizing of such shameful phenomena as hatred of one’s native language and culture, national nihilism and betrayal. This was a truly internationalist Leninist policy which safeguarded the interests and the full development of the socialist Ukrainian nation. But after only years this policy came to an end and the men who had been implementing it were removed. This was done by Stalin notwithstanding the resolutions of the Comintern and the Party Congresses, it was done silently, ‘quietly’, without any justification, theoretical or political. The resolutions were not carried out, they were not revised or repealed, but were simply put aside and replaced by quite opposite decisions. Even today the concept of ‘Ukrainization’ is considered odious, and people are ‘ashamed’ or afraid to mention it, although, we repeat, it was a Leninist policy, elaborated at Party Congresses and approved by the Comintern. There began a policy of destroying the achievements of the previous period, a policy of physically destroying the Ukrainian nation, especially its intelligentsia. This reversal was indeed one of the greatest tragedies of the Ukrainian people in its entire history. Not only was this a tragedy for the Ukrainian people. It was a betrayal of socialism that left the USSR more vulnerable to “divide and conquer” tactics by imperialism. The best way for the USSR (and even Putin’s Russia) to ward off NATO and CIA subversion is to build solidarity with every citizen. The price to pay for Great Russian chauvinism is relatively inexpensive. It takes a commitment to the original vision of the Soviet Union that Dzubya tried to convey in this classic of Marxism.